The biggest input for a successful content marketing engine is quality content. But the internet is awash with both good and bad content. So how do you navigate this sea of mediocracy and surface the gems that will get you better results? And... without spending hours and adding more tools to your workflow? I know what you're thinking. "I'm not really a fan. Lists on Twitter just add more noise to what I'm doing..."
But I have a simple process that bypasses all that headache. It makes managing Twitter lists a doddle so they deliver results, without the faff. A Twitter list is way to organise the people that you follow into relevant groups. By doing this it means you can filter by Tweets from just that group. Rather than having to sift through everything in your timeline. We all know how overwhelming that can be! This helps us to focus in on valuable content, and cut out the noise. In fact Buffer have already compiled a list of 23 ideas for using Twitter Lists here. We won’t go into the step by step process of how to create lists on Twitter. Click the link if you want more details on that. Instead, lets focus on what's more important. How to make sure you are actually creating the RIGHT lists. Which all comes down to the accounts that you add to them. What do I want to use Twitter Lists for: fresh content for your social media channels or newsletter? Weekly roundups? Inspiration for your next blog post? Then what broad lists do I need to create to satisfy these needs? Who do I need to add to these lists for them to be high value? Think about creating several different lists if it makes sense. I find that segmenting lists by topic or use-case helps you stay focused and on top of the content. The most important part of getting the right content in your list is which sources you add to them. The first one is to review each source properly against the purpose of the list. You only want to add high value sources, otherwise the info will become overwhelming. Start with bloggers and influencers you are already a fan of. Do they follow any sources you could benefit from adding? Which content has already resonated with your audience? Who are the authors? Use Buzzsumo‘s ‘Influencers’ search to find influential people on key topics. It also has links to their Twitter accounts and will tell you how engaged they are. It also will give you insight into the number of followers, and Retweet/reply rates for them. You can also use Google (or Buzzsumo) to find the best blogs on specific topics. Just use search terms like “Top content marketing blogs”. The results are then filled with hand curated lists of quality sources. Steer clear of adding publishing or news sites. They publish A LOT of content, and you want to keep the stream focused and relevant. Once you've added your sources spend time to review if the sources are still relevant every now and then. As over time you will notice some sources are helpful, and some aren't. Or that you are still not getting the right content in your stream. As you’ll see in the next half of this post, the legwork is actually over once your lists are up and running. It creates "another" place to keep an eye on to find good content. When they alreadyt feel overwhelmed. But... it doesn't need to be another place. RSS, and sending everything to an RSS reader like Feedreader or Feedly. What is RSS? In its simplest form it is a feed of the latest information from a specific site. That other sites and applications can read. In this case an RSS of a Twitter List would be a feed of all the Tweets published in the list. Now... those familiar with RSS will be saying; "thats great, but you can't convert Twitter lists into RSS." This used to be true. Changes to the Twitter API a few years ago meant that Twitter stopped native support for Twitter to RSS. But, because we find Twitter lists such a valuable source of content, weve built a free tool to get round it. What's the big deal about turning a Twitter List into an RSS Feed? By converting a Twitter list to RSS, you can send all the Tweets from the list straight to an RSS reader. Which means you can then read and sort through all your content sources in one single place. You can send fresh content to a host of other marketing tools that accept RSS feeds. Making the content highly actionable. Lets look at each of these in more detail. 1. Add the converted Twitter List RSS feed to your favourite RSS reader. Now you don’t need to visit Twitter AND your RSS reader. RSS readers are pretty much unrivalled when it comes to bringing all the content you want to see in one place. RSS readers will also help you to keep the incoming content more organised. RSS readers make it easy to tag and organise the incoming content. You can scan titles to discount irrelevant content and save stuff worth another look. RSS readers make the stream of content managable. One location to view and organise it all so you can keep on top of it all and find the gems. You can even send feeds straight to your inbox with tools like Blogtrottr or FeedMyInbox. Plus, you can set how often you receive summary emails – daily, weekly, monthly etc. But thats not all you can do with your Twitter List RSS Feed. 2. Add the Twitter List RSS feed directly to your favourite marketing tools. Reading and organising content is one half of the job. The other half is what you actually do with the content once you've earmarked it as high value. By connecting Twitter lists to your marketing tools you automate a lot of the process. It means you have quality content where you need it, when you need it. Automatically. Lets review some of the tools that will maximise your Twitter lists. As mentioned above, RSS readers are fantastic for reading everything in one place. Another great benefit is that they strip back the visuals on the content. So you can read things without adverts and other design fluff. Perfect for a very focused reading experience. RSS readers also offer integrations so that allow you to action the content there and then. BONUS: Feedly connects straight to your library in Publicate. So you can automatically send the best bits straight to your newsletter. Try the newsletter creator now. Any readers who are part of a team, particularly a remote team, will probably be familiar with Slack. What you may not know is that you can automatically pull an RSS feed into a Slack channel. We mentioned above how using Twitter List RSS feeds can help you share to social media more easily. If that’s something that’s important to you, consider adding it to Buffer or Dlvr.it directly. You can grab content right from feeds and post it (or schedule it for later) straight to your social media feeds. The best thing about this is how easy it makes having a stream of fresh content for your social media channels. You'll never run out! 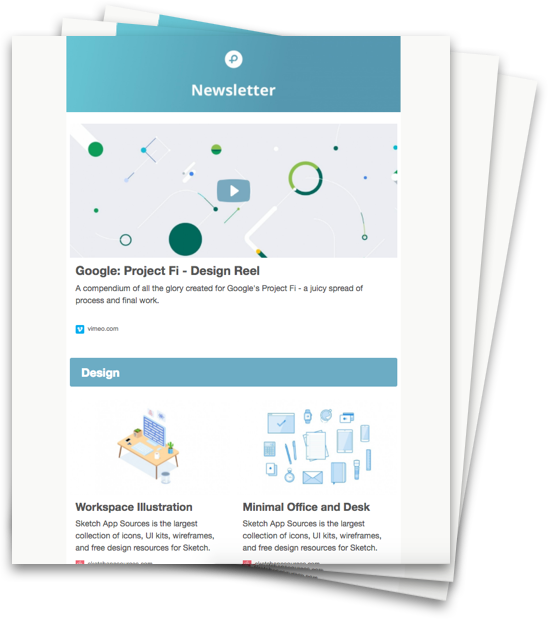 Publicate makes it easy to create beautiful newsletters from curated content. When you connect it to your Twitter RSS feeds you instantly add valuable to your content library. Ready for you drag and drop straight into your newsletters. It even scrapes the images and titles from each piece of content. Saving you hours each time. If you want to take things even further, you could experiment with automation and use IFTTT or Zapier. These tools are like API's for the internet. They work by connecting all the major platforms online to each other. Which you can then create rules for to supercharge your workflow. For instance, you could connect your Twitter RSS feed to Pocket. So that you could read content offline on your mobile. Or use the search feature to find specific pieces. Zapier allows you to filter, combine or tweak RSS feeds to create what they term as ‘superfeeds’. That means you can use it to apply a filter the content before pushing it to various platforms. Crafted what you believe to be perfect marketing Twitter list? You might want to consider sending the well tuned stream of content straight to your blog. Keeping your readers entertained with a live stream of fresh content. Which you know is quality because you did the upfront vetting. Since Google Reader closed back in 2013, people have been talking about whether RSS feeds are dead or not. We always think it’s exciting to find new uses for something. The exciting thing about converting Twitter Lists is there’s still so much potential. Twitter lists and RSS feeds might not necessarily seem like obvious bedfellows. But, we hope that you’ve now picked up a few new ideas on how to put them to work!